Karasar Kennel proudly introduces some of our up and coming youngsters. "Artistry" started off her show career in January 2007 by winning Best of Breed over Specials, at 9 months of age, from the Bred By Exhibitor Class. She finished her championship, entirely from Bred By Exhibitor Class, at 10 months old with another Best of Breed over Top Ranked Champions. In the 40 years that we have been breeding Whippets, we feel she is closest to the ideal that we have ever had. Shown as a youngster, Artistry ended up a Top Ten Whippet for 2007 (All Systems) shown on a very limited basis. She ended up as the NUMBER ONE WHIPPET IN THE USA FOR 2008 !! !,(AKC All Systems) Artistry is proudly breeder/owner/handled by Kerrie Kuper. Her first litter was born February 16, 2009 and she is the dam of TWO DIFFERENT ALL BREED BEST IN SHOW WINNERS. Look below for pictures of youngsters from her first litters!! "DREAMEE" Is our keeper girl out of Ch Karasar's Artistry's first litter. Pictured here at 12 months old, and very much like her grandmother, MBIS Ch. Karasar's Reminiscent ROM. She completed her Championship at 12 months old exclusively from Bred by Exhibitor class with a Best of Breed over TWO DIFFERENT BEST IN SHOW WINNING WHIPPETS. Exclusively breeder owner handled by Kerrie Kuper. "MOBY" Is a handsome young man out of Ch Karasar's Artistry's first litter and littermate to Dreamiest. Pictured here at 14 months old, he has a beautiful head and expression and a very "Stallion" like quality about him, with substance at 21 1/2 inches tall. He finished his Championship entirely from the Bred by Exhibitor class and is the sire of Champions and all the other littermates pointed in his first litter born July, 2010. Co-owned with Kim & Jessica Chonko and breeder owner handler Kerrie Kuper. "JULIET" From the second litter of Ch. Karasar's Artistry. The ONLY girl in a litter of two, she is a MULTIPLE All Breed Best in Show Winner, Reserve Best in Show Winner, Specialty Best in Sweepstakes winner, American Whippet Club specialty winner and completed her championship entirely from the Bred by Exhibitor class. She completed her AKC Grand Championship in a record of SIX shows and we believe NO OTHER WHIPPET IN THE USA has completed his/her Grand Championship in a shorter amount of time. She was shown for a couple of months in 2011 at under 2 years old and ended up being a top 5 Whippet. Pictured here at 10 months old she is linebred on her grandmother, MBIS & MSBIS Ch. Karasar's Preference, ROMX. 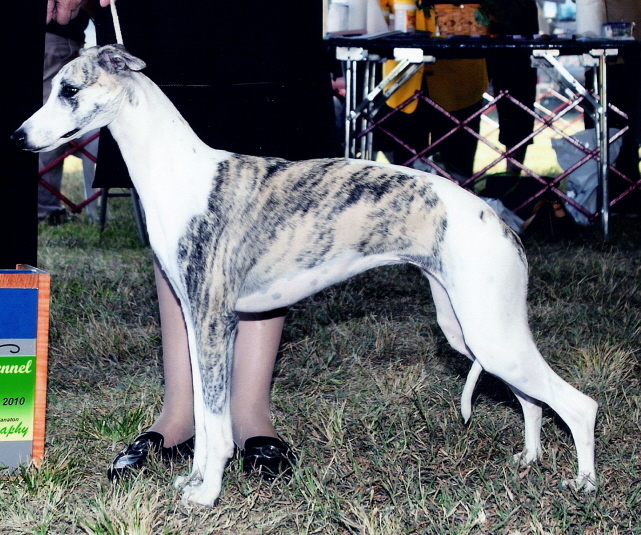 She was the Number ONE Breeder Owner Handled Whippet for 2011 in just a couple of months of shows. 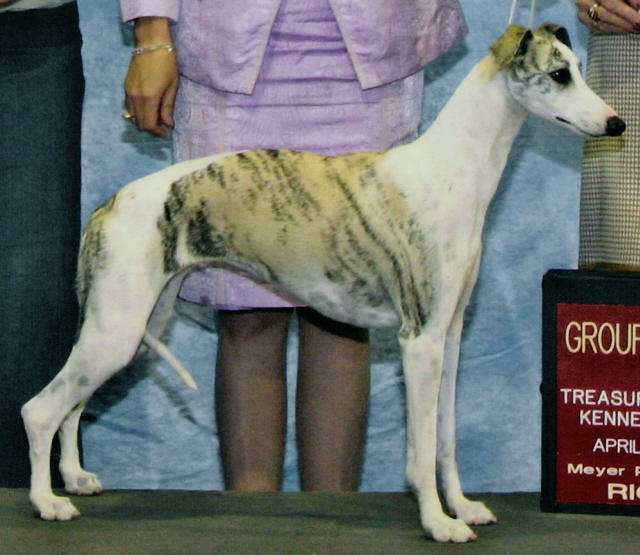 She was a top ranked whippet for 2013 only shown a handfull of weekends and ended up # 2 Whippet and # 12 Hound in the USA for 2014 winning multiple whippet specialties and all breed best in shows. Owned by Neil Barthelette, Kerrie Kuper and Karen Mlynar. Breeder owner handled by Kerrie Kuper Click here to see her in the Best of Breed ring on her way to her FIRST All Breed Best in Show. 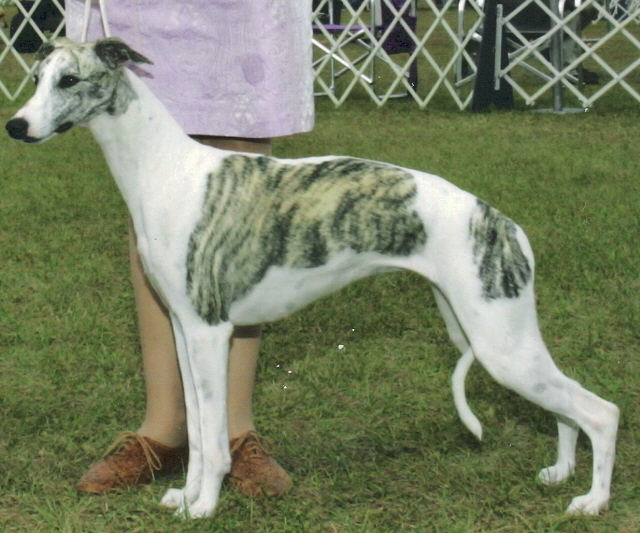 She ended up a top 10 Whippet for 2015 only shown until May 2015 retiring from active campaigning by winning another reserve best in show and then whelped a litter of 7 on June 21, 2015. She is exclusively Breeder Owner Handled by Kerrie Kuper. "BRITANEE" is from the third litter of Ch. Karasar's Artistry. 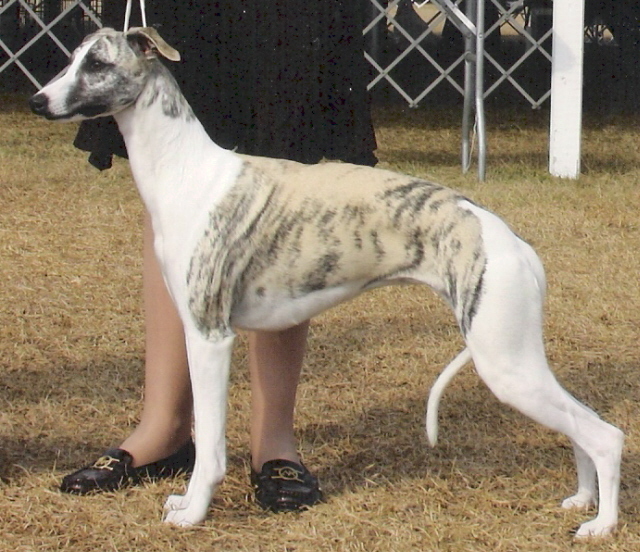 Her VERY FIRST AKC show was the American Whippet Club National Futurity where she won FIRST in the 8-10 month class. She completed her AKC Championship in record time of 12 shows later, entirely from the Bred by Exhibitor class, with TWO BESTS IN SHOW at the Purina Breeders Showcase in Orlando Florida in June 2011 at 11 months old. She also won her Sweepstakes class at the AWC South Central Regional Specialty in July 2011, still in the puppy class, and was RWB from the BBX class. Pictured here at 8 months old she is linebred on her grandmother, MBIS Ch. Karasar's Reminiscent ROM. A Multiple ALL Breed BEST IN SHOW winner, Reserve Best in Show winner, AND Owner Handler Best in Show winner AND she was # 1 ALL BREEDS AKC OWNER HANDLER SYSTEM FOR 2013. Her first litter was whelped Dec 8, 2013. Exclusively Breeder Owner Handled by Kerrie Kuper and co owned by co breeders Karen Mlynar, Neil Barthelette and co owned by Drs Manuel and Azalea Alvarez. "Windee" is from all Champion litter of 3 born June 21, 2012 and the third repeat of the GCH Karasar's Jackpot/Ch. Karasar's Artistry breeding's. Her VERY FIRST AKC show she was WB for a 4 point major. She completed her AKC Championship in record time entirely from the Bred by Exhibitor class. Very first time shown as a special she won a group three under a breeder judge. She is co owned by co breeders Karen Mlynar, Neil Barthelette & Kerrie Kuper and co bred with Al Miniero. "PENNY" Is out of the last litter for Ch Karasar's Artistry's. She completed her AKC championship in a total of 7 dog shows from BBX class at 12 months old in 2015. 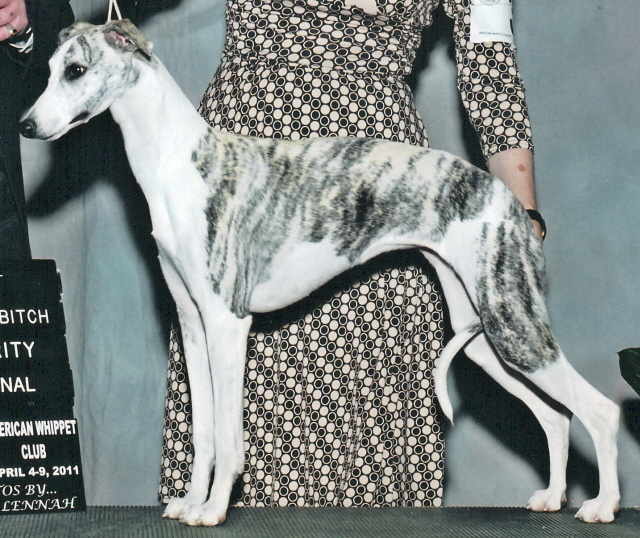 Her very first show as a move up special she won a AWC Supported entry of over 30 Whippets. Only shown a handful of times as a special she is a multiple best of breed winner and group placer. We feel she is as good as her mother and look forward to presenting her to the fancy in 2016/2017. Bred owned and handled by Kerrie Kuper, Neil Barthelette and Karen Mlynar. "PAR EXCELLENCE" is our FIFTH GENERATION MULTIPLE BEST IN SHOW WINNER, ALL BREEDER OWNER HANDLED. We believe this is a record that NO other Whippet breeder in the USA has achieved. She finished her Championship shown exclusively from the Bred by Exhibitor class with TWO GROUP FIRSTS AND a Group THREE over Top Ranked Champions of 2009, at 14 months old. 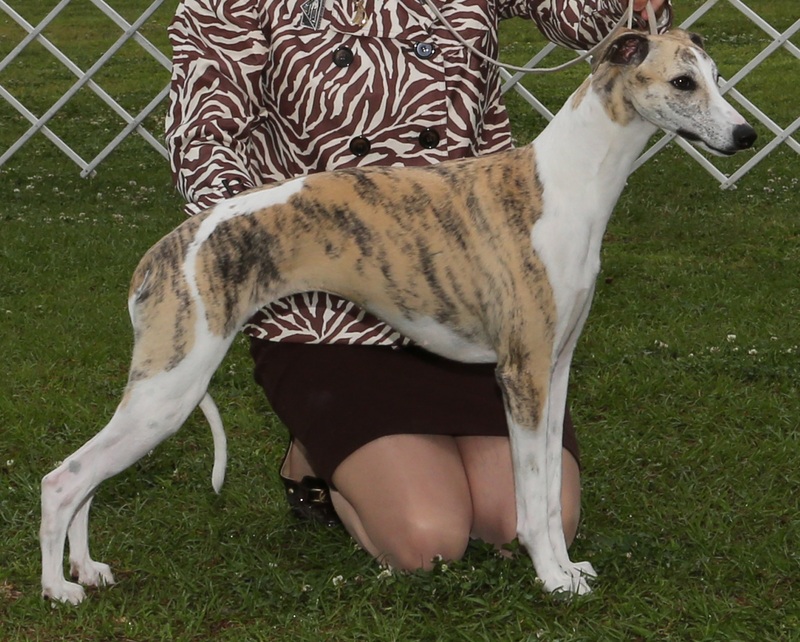 Number ONE breeder owner handled Whippet for 2010 & 2009 and # 2 behind her kennel mate Masterpiece. 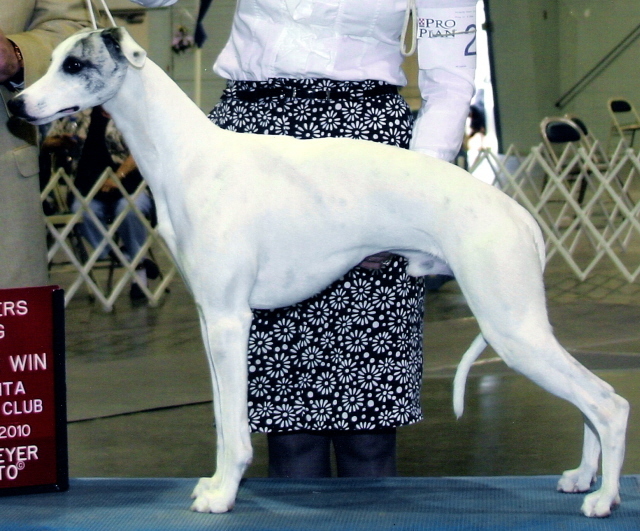 (Canine Chronicle All Breed) SHE IS THE VERY FIRST AKC GRAND CHAMPION WHIPPET. Her first litter was born October 14, 2011 sired by Ch. Karasar's Dreamboat. We are expecting MORE outstanding youngsters from this pair. "SALLY" is the first champion for our Tradewind. BOW at AKC National Championship December 2015 as a 12 month old winning THREE majors that week. She completed her championship by winning best of breed over 3 champions under one of the most respected sighhound breeder judges in the USA. We feel her potential as a top winning special is unparalleled. Bred and owned by Kerrie Kuper, Karen Mlynar and Neil Barthelette and co bred by Pamela Davis. Watch for her with Breeder Owner Handler Kerrie Kuper in 2016 on a limited basis. "Averee" is the first champion for her dam, Remembrence. A multiple reserve best in show winner and top ranked whippet for 2015 & 2016. One of our most admired Karasars by breeder and sighthound judges world wide. She is owned and bred by Kerrie Kuper,Neil Barthelette and Karen Mlynar, and co bred by Dr's M & A Alvarez and William Othick. "GINNY" is the second champion for our Remembrence. 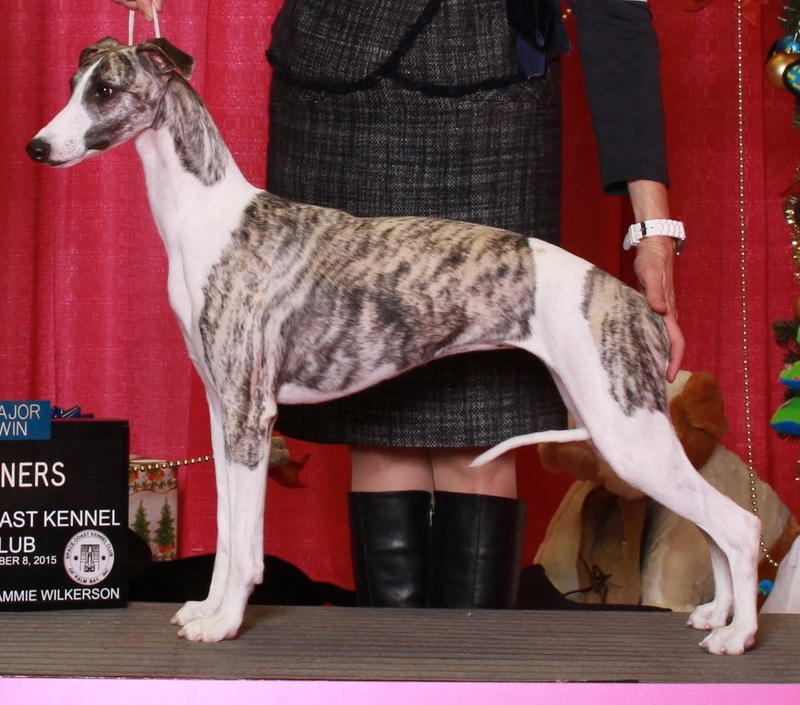 Owner handled by Michelle Evans at less than 2 years old 2015 UKC # 3 Whippet, UKC Best In Show winner, 2015 AWC Supported Entry Best In Sweepstakes, 2015 AKC OHS #20 Whippet. In 2016 AKC Senior Courser, AFSA Pointed, 2016 OH Group 1 and other group placements. She is owned and loved by Michelle Evans and co owned by her breeder Kerrie Kuper.